Madison Square Garden is often touted as “The World’s Most Famous Arena.” It's known to many in the New York City area as simply “The Garden” because of its preeminent position as a sports and concert venue. Located in the heart of Manhattan at 4 Pennsylvania Avenue on 8th Avenue between 31st and 33rd Streets, the "new" Garden opened in 1968. It replaced the previous Garden which was situated on 8th Avenue as well as between 49th and 50th Streets. The "old" Garden operated from 1925 to 1968. The current Garden is the longest active major sporting facility in the metropolitan New York area. It's home to the New York Knicks, the New York Rangers and a wide variety of other sports competitions, including the NIT college basketball tournament finals. The Garden also hosts major concerts, the Ringling Brothers Circus and other big New York City events. It houses the Theater at Madison Square, which has been the venue for the NFL and NBA drafts, CBS Television's fall premiere, and many other families and theatrical productions. The Garden also launched the MSG Network in 1969, the first-ever regional sports network in the U.S.
MSG internships are designed to be very hands-on. They're offered in the fall, spring and summer semesters. Candidates may want to look into a ​future career with MSG upon completion of an MSG internship. 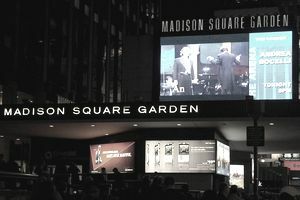 Madison Square Garden's Student Associate Program can prepare students for careers in a wide range of disciplines, including communications, finance, human resources, entertainment marketing, television sales and marketing, operations, production, website development, content management, and IT support and troubleshooting. All MSG internships are paid and students are able to receive a number of discounts for programs and events. Students may receive college credit by working through their college or university, but college credit is not a requirement of the program. Candidates must be currently enrolled in college and working toward a two-year, four-year or graduate degree. They must provide a letter from their school verifying enrollment. Candidates must possess solid communication, time management, and interpersonal skills. Candidates must maintain professionalism on the job. Strong organizational skills are required with an ability to multitask. Candidates must be proficient with basic computer programs, including but not limited to Microsoft Office and Internet Explorer. Candidates should be available to work a minimum of 21 hours and up to 35 hours a week. Fall semester (September through December): Applications are accepted from April 1 through June 1. Interviews begin the last week of June and conclude the first week of August. Spring semester (January through May): Applications are accepted from August 1 through October 1. Interviews begin the last week of October and conclude the first week of December. Summer (June through August): Applications are accepted from January 1 through March 1. Interviews begin the last week of March and conclude the first week of May. You can learn more about how to apply on their ​student opportunities page.